Though the situation remained tense, it was an incident free day as the indefinite shutdown, spearheaded by Gorkha Janamukti Morcha, entered the 23rd day. DARJEELING: GJM activists today took out rallies here demanding withdrawal of security forces from the restive Darjeeling hills even as the Calcutta High Court questioned the Centre whether it does not think the agitation for a separate Gorkhaland needed to be quelled quickly. Though the situation remained tense, it was an incident free day as the indefinite shutdown, spearheaded by Gorkha Janamukti Morcha (GJM), entered the 23rd day. Rallies were also taken out by activists of other parties who were dressed in traditional Nepali attire. They were heard shouting slogans in support of Gorkhaland. Meanwhile, the GJM appealed to the chairmen and vice-chairmen of all the development boards in the hills formed by West Bengal Chief Minister Mamata Banerjee to resign immediately and join the Gorkhaland movement. "In the last 15 days, many members have already resigned. Only some are left, we want them also to join us," said a senior GJM leader. The Morcha took out a rally from Darjeeling station to Chowkbazar in the afternoon to press its demand for withdrawal of forces from the hills and restoration of Internet services, which have been snapped since June 18. Police and security forces kept a tight vigil on each and every exit and entry routes to the hills. In Kolkata, hearing a plea for restoration of normalcy in the Darjeeling hills, the high court wondered, "Given the geopolitical area in which it lies, doesn't the Centre think this agitation be quelled immediately?" A division bench of acting Chief Justice Mhatre and Justice Tapabrata Chakraborty directed the West Bengal government officials to sit with the Ministry of Home Affairs to sort out the requirements for paramilitary forces on the basis of ground conditions. Expressing displeasure at the state and the Centre sparring over requirement of central armed police force, the bench observed, "The situation can improve only if both of you sit together and sort out the issues." The court asked the Centre and the state government to reach a meaningful understanding over force requirement before July 11, when the matter would be heard next. 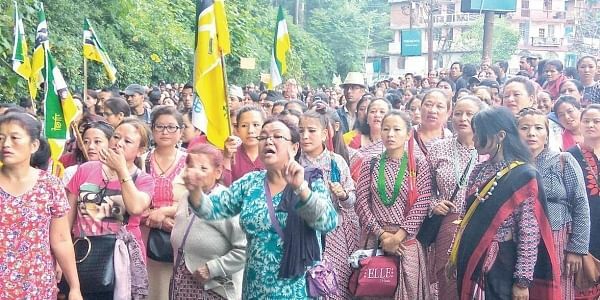 Normal life has been affected severely in Darjeeling and Kalimpong due to the ongoing indefinite shutdown enforced by the GJM and some other hill parties since June 15 over a separate statehood demand. The Union home ministry said it was is keen to hold tripartite talks with the GJM. "We want to hold dialogue with the agitating organisations so that peace returns to Darjeeling. In the talks, the West Bengal government's presence is necessary as law and order is a state subject," a home ministry official said in New Delhi. With food supply severely hit due to the ongoing shutdown, GJM activists and NGOs of the hills were seen distributing food items among the people. Except medicine shops, all the shops, schools, colleges remained closed. All parties in Darjeeling hills had yesterday decided to continue with the indefinite shutdown.